So cute and delicious!Such wonderful and unique moments with your beautiful family!Great photos!Hugs and happy Thanksgiving! Oh my word, Kitty - those are so cute! And the smiles on your faces - priceless. I am so happy you are able to enjoy these precious moments. Just adorable Kitty! The turkey treats and the smiling faces of your family! Wishing you all a wonderful Thanksgiving holiday! Hi Kitty, I love those cute pretzel turkeys and I know you and Cissy always have a fun time baking together! Thanks for sharing this recipe at C&C with J&J. Ahhhh, so cute. Rollos are wonderful. you and Cissy have way too much fun. Love to see you both making memories. Oh, how wonderful! It looks like you have had a busy week and time, but you look so happy! Thank God for those special moments, and I hope they continue right on through the Thanksgiving holiday, sweet friend, God bless you! Praying for you! What adorable creations...I just love your Cissy's smile when she shows off her work! Great photos of your girls...making special memories for them all. Well, Kitty, this is a feast for the eyes, and I'm not talking about the turkeys (although they look good too!). All you ladies have the brightest smiles and what appear to be very happy hearts in these photos. I'm happy for you to be able to spend time with your kids. I can only imagine Cissy introducing you to her friends at the lunch table! these are the sweetest little candies. I saw them on Pinterest first and then your photo on FB and they caught my eye because I love ROLOS! If I have some extra time I am going to make these. 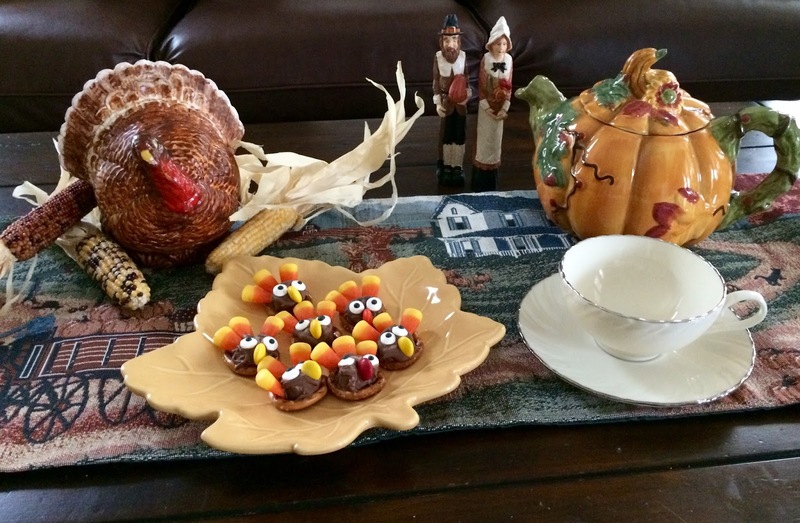 They will add some whimsy to the Thanksgiving table for sure! Btw, you have a beautiful family! Happy Thanksgiving Kitty! AHHHHHHHHHHHHHH! Stop! Those are so stinkin' cute!!! Sounds like your holidays are off to a fun and busy start. And those turkeys are just the cutest! What adorable and tasty treats! I hope to email you soon, but wanted to let you know that sadly, we won't make it to Texas this year...how I would have LOVED to visit you. I had a chuckle at your turkey treats Kitty...I used to make them with my kindergarten class when I was teaching...the kids loved them...and your granddaughter obviously does too! Loved seeing the family as well! Have a very Happy Thanksgiving and thanks so much for linking to Tuesday Cuppa Tea. These are so cute, Kitty. Darling photos of you and your girls. Happy Thanksgiving! 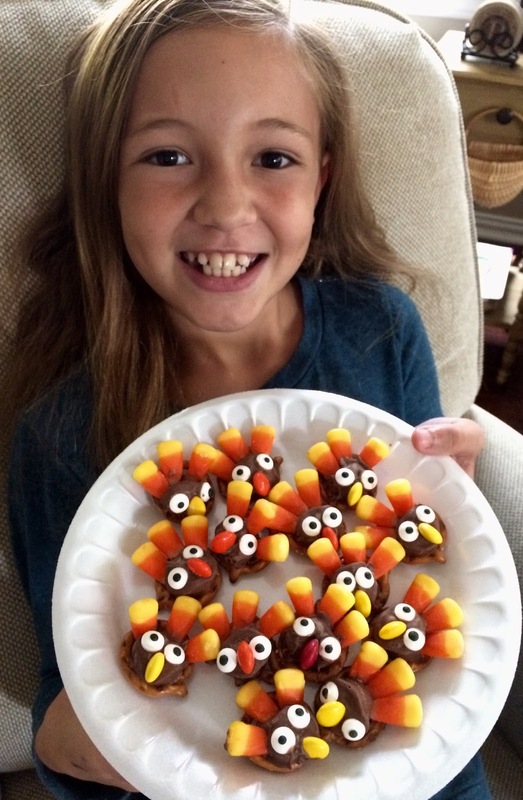 Cute turkeys and what a great project to make with your granddaughter. Love the photo of you and your girls. Happy Thanksgiving from a neighbour up north! I'm not a candy eater myself, but those are awfully cute! But not as cute as you and Cissy! 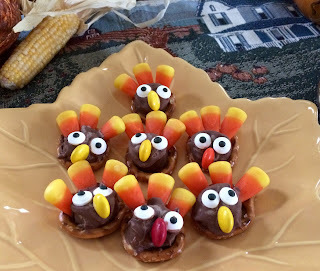 Your Pretzel Rolo Turkeys are just adorable. 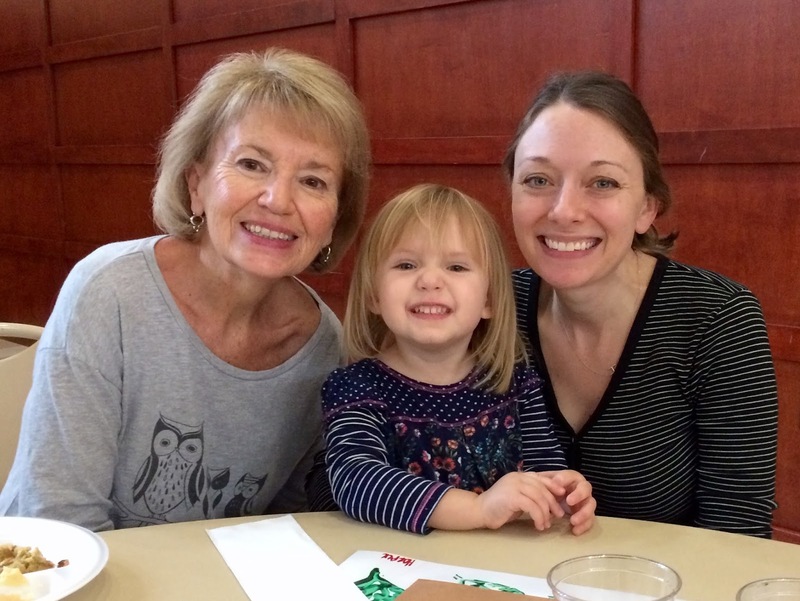 It is great to spend time with family over the holidays, looks like you all are having a lot of fun! Thanks so much for sharing with us at our Thanksgiving Edition of Full Plate Thursday! Hope you have a great week and come back soon! Love your Rolo turkey pretzels. Looks like you have been busy visiting all your kids activities. That is so special. 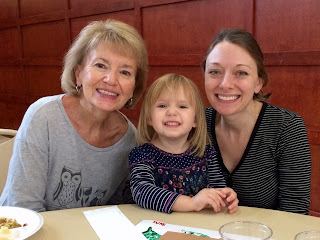 I'm behind on my blog visiting since I had my grands for seven days for the Thanksgiving holiday. I bought prezels, rolos and reeses pieces and never found any candy corn so we didn't make them. We did have a tea party after Thanksgiving and it became a Christmas tea party. Hope to blog about it later.